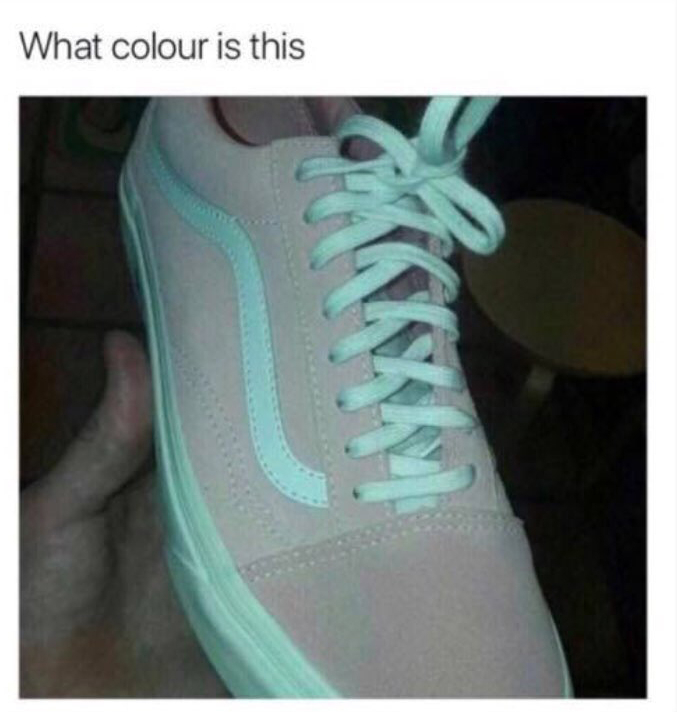 perceptionsense: What Color Are These Sneakers? Similar to internet's debate of #TheDress, there is another color debate about what is that color of these shoes. Some are saying that they are seeing teal and grey while others are saying pink and white. So which is it - teal/grey or pink/white? Well... the answer is that they are actually pink and white! The reason why people are seeing teal and grey is because of the picture's bad lighting that gives off the color of teal and grey (similiar to people seeing blue and black for the #TheDress). Also it has something to do with the cones in the back of our eyeballs that perceive colors in a slightly different way depending upon our eyeballs. Our brains are constantly estimating the color of light that's falling on the object and then factoring the light out. With this, many people still believe that they see teal and grey rather than pink and white. These things always stressed me out!! It makes my brain hurt to think that other people are perceiving the same image differently. I 100% see teal and grey! I can't even see a hint of pink or white! I also see teal and grey! Weirdly enough, I can see a slight shade of pink at the top front of the shoe. With the dress debate, I was able to see black and blue and I was also able to see white and gold. The colors would go in and out especially the more I concentrated and though about it. However, with this picture I can not see white and pink. It also hurts my brain to think that someone is seeing different colors on the same image lol. It is also quite funny how these pictures have created such controversy not only on social media but with friends and family as well! These pictures also always make my brain hurt because I can never see it the other way! I also only see teal and gray, as well as with the dress I only saw black and blue. It is crazy how with the same lighting and contrast on one phone, multiple people see things differently. It is simply amazing how this does happen. There is always controversy over all images like this on social media like Madison had said. I see pink teal and grey and when the dress debate came out I also saw black and blue. These things frustrate me because I can't see how someone could see the other color. When the dress came out people at my school went crazy trying to see what color other people see and arguing about if they were wrong (if they saw a different color). There are so many color debates out there on the internet yet they never fail to interest me haha! I personally can only see teal and gray in these sneakers. I read these pictures have everything to do with the type of lighting people perceive the item to be in (either warm or cool toned). Great post ! When I look at this picture I see teal and grey, and I see hues or splotches of pink on the top of the shoe as well. Furthermore, with the dress debate, I was only able to see black and blue. It was very interesting to read that the colors people are seeing can differ due to the cones behind our eyes. I am curious of what the response would be if a colorblind person was shown this picture and the dress picture and see what their responses are. Overall Great Post!